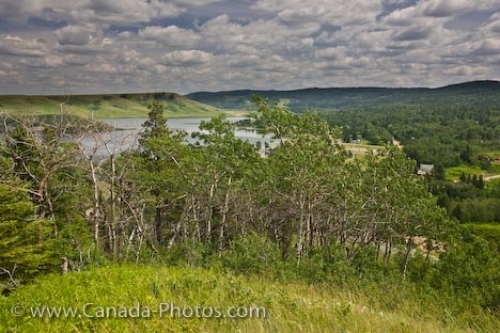 From a viewpoint in the town of Elkwater in Cypress Hills Interprovincial Park in Alberta, Canada, visitors can look out over the scenery of Elkwater Lake. Due to the fact that Elkwater is located in a provincial park, a small population of a little over a hundred people reside in this town, but many tourists spend their time hiking across this wilderness landscape. Photo of the scenery of Elkwater Lake from the Old Baldy viewpoint while hiking in Cypress Hills Interprovincial Park, Alberta. View of Elkwater Lake from Old Baldy viewpoint in the town of Elkwater, Cypress Hills Interprovincial Park, Alberta, Canada.